Bael also known as Stone Apple, is an indigenous plant commonly found in India. If you visit the countryside during summers, a lush green bael tree laden with bael fruits is likely to soothe your eyes in an otherwise parched landscape. 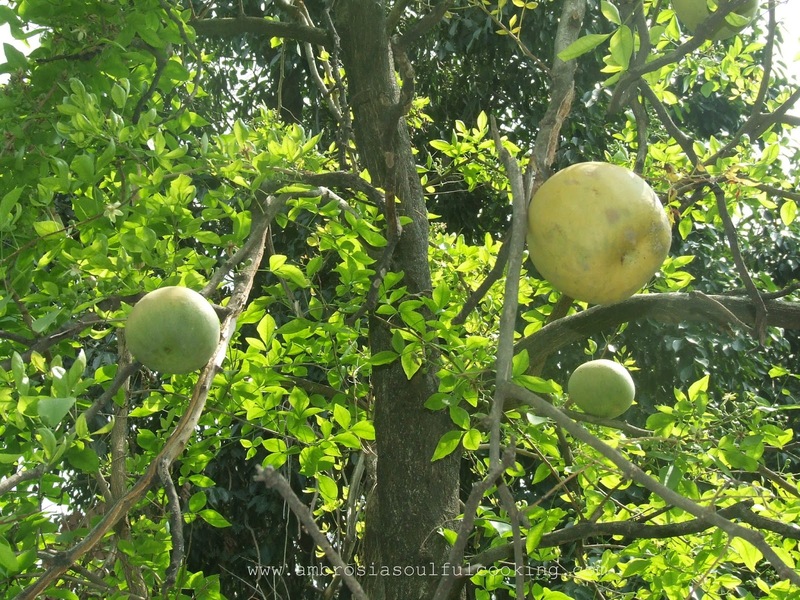 In Kumaon, it is a tradition to have a bael tree at home. My father has three of them. He nurtured them with great love and care till the plants turned into trees. 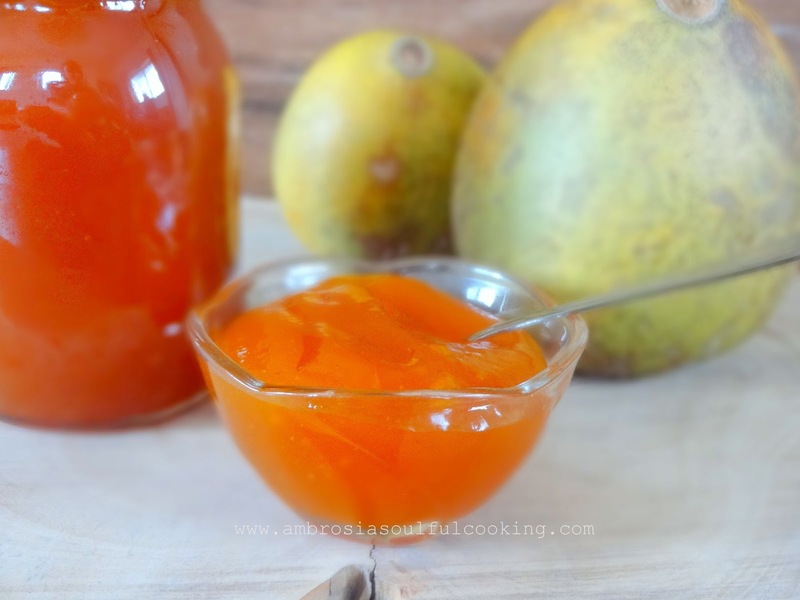 During summers, we used to hunt for ripe bael fruits fallen and hidden in the grass. Now my daughter loves to spot one and get it to her Nana. Bael fruit has great medicinal properties. The yellow sticky sweet pulp consists of carbohydrates, proteins, vitamin C, iron, phosphorous, carotene, thiamin and fiber. Bael is very good for stomach and is useful in the treatment of digestive and gastrointestinal disorders. Ripe bael fruit tones up the digestive tract and promotes proper bowel movement. It is a natural laxative and removes constipation. Bael fruits are most widely used in Ayurvedic medicines due to its strong digestive and carminative properties. Bael Nectar is made from the naturally ripened bael fruits. My father guided me to make Bael Nectar and it was his suggestion that I post this recipe in my blog. 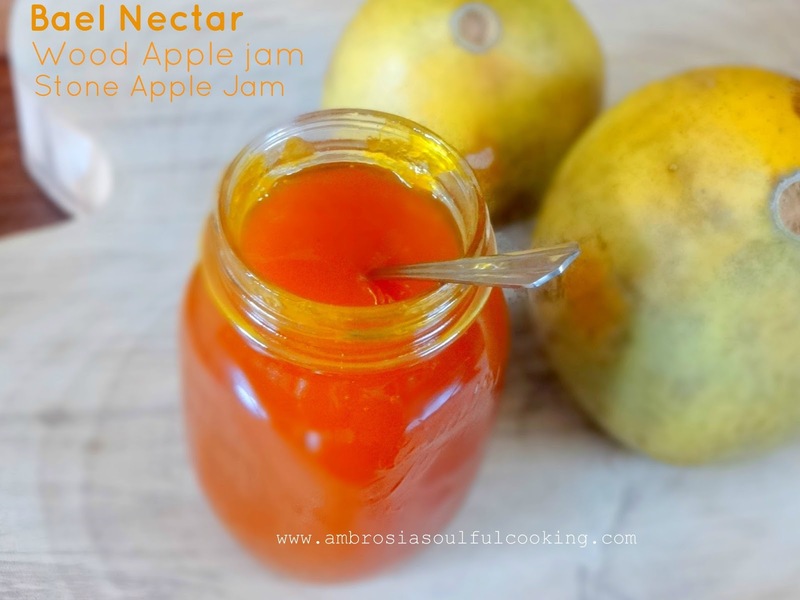 Bael nectar or Bael jam is a way of preserving the Bael fruit as Bael fruit has immense health benefits and is not available round the year. A spoonful of Bael nectar with milk tones the stomach improves digestion and helps in constipation. It can also be had with bread and chapatti as jam. Remove pulp from the fruits and put it in a bowl. Add ¼ cup water to it and mash the fruit. Pass the pulp through a fine sieve. Remove all the seeds and fibrous strands. Add sugar to the sieved pulp and let it rest for an hour. Cook this on a medium flame. Keep stirring the pulp to prevent it from sticking to the bottom of the pan and burning. In an hour’s time, the nectar will become thick and will be reduced to half of its original volume. When it falls from the ladle in blobs, it is done. In the meantime, sterilise the bottles. Place the washed and dried bottles with the lids in the oven. Set the temperature to 100 degrees and set the timer to 10 minutes. Remove the bottles and their lids from the oven. Fill the nectar in the sterilised bottles while the nectar is hot. Such a lovely recipe that is forgotten by the modern world. 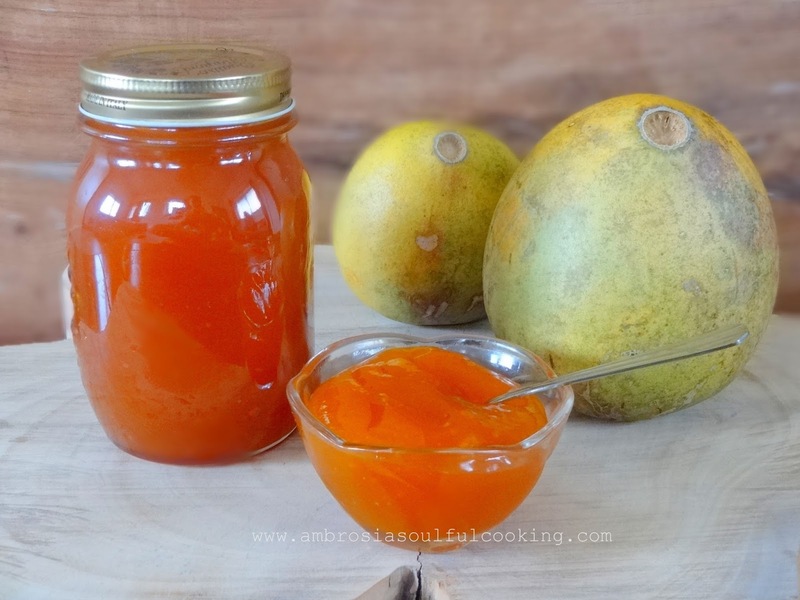 I have a bael tree, make the sharbat regularly and this jam at least once every year but what a shame I couldn't post the recipe. Keep doing the good work. Much love. Hi! I made this jam. It is such a wonderfully tasting recipe. However I reduced the sugar content and felt that the taste of lemons masked the nice fresh taste of bael. In my next batch I shall make the alteration. I understand high sugar and lemon will both act as preservatives but still I would like to see how long it lasts in the fridge. 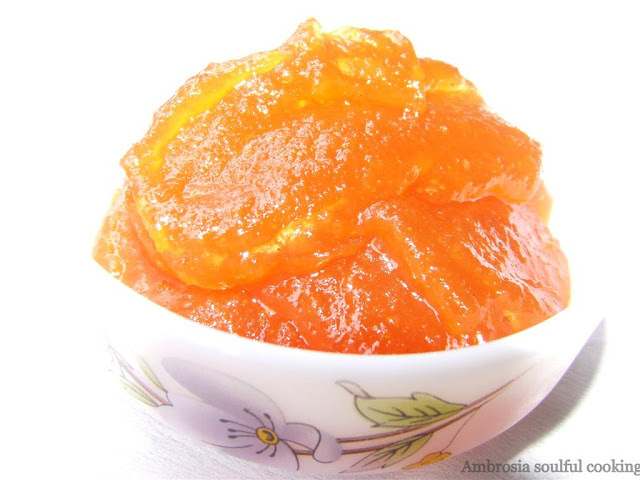 Hello Ananya, I am happy that you tried this recipe. This is really an unsual jam isn't it. I am planning to make another batch soon as we have a lot of baels growing here.